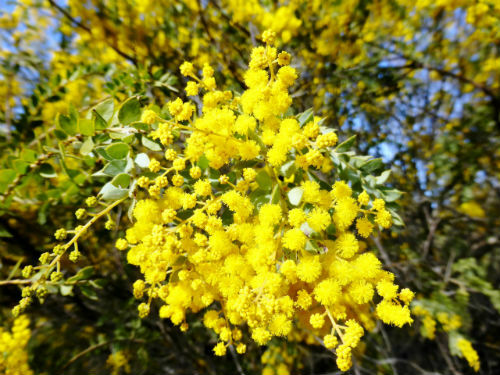 Acacia vestita, the Weeping Boree, is a medium to tall spreading shrub reaching a height of 3 metres with a similar spread. The branches are pendulous and the foliage is grey-green. Phyllodes are ovate to elliptical in shape, 2 centimetres long with a fine point. Both branchlets and phyllodes are covered with tiny hairs. The golden yellow flowers are held in dense globular clusters. Plants light up with blooms from early August to October. Remove each branch behind spent blooms as this will encourage fresh growth and bounteous blooming. Both foliage and flowers are eye-catching features. A. vestita could be cultivated as a specimen shrub in the middle of a lawn or incorporated in shrubberies and hedges. The Weeping Boree is found in a few localities on the Western Slopes and Southern Tablelands of NSW. 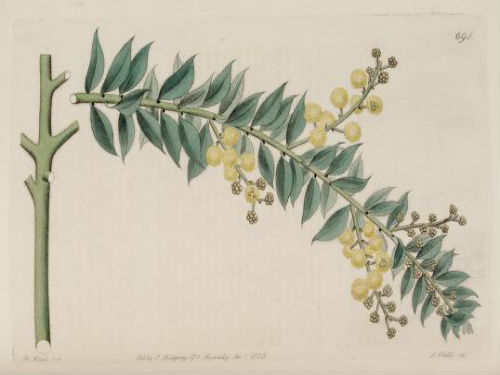 The type specimen was named from material collected from a cultivated plant growing in the conservatory of Comtesse de Vandes, at Bayswater, UK in 1823. The plant was grown from seed collected by Allan Cunningham from “the interior of New Holland”. The image is from the original description. The species name means clothed and refers to the hairy covering of the phyllodes. Propagate from seed, treated with boiling water before sowing, and probably cuttings.